The CPA exam or the Uniform CPA Examination is recognized as one of the most difficult professional exams. Believe me. I know how difficult it is. Six months of studying and four sections later, I passed the entire CPA exam the first time. If you have sat for one section, you know this is no easy feat. The CPA exam is developed and created by the American Institute of Certified Public Accountants or the AICPA to be the primary licensure exam in the United States. Some state also require an additional ethics exam once the CPA exam has been completed. Before you can take the CPA exam, you have to meet the minimum educational requirements. Each state has its own set of requirements, so it is a good idea to visit NASBA to see if you meet the requirements in your state before you start studying. In general, most states have the same testing requirements. Exam candidates must have 150 college credit hours of education with a specific amount of hours designated to accounting, finance, business, and law courses. Also, at least a bachelor’s degree must be completed in the 150 credit hours. In other words, you can’t just take random college classes until you reach 150 hours. You have to have a bachelor’s degree in something along with specific related courses. Once you pass the exam, many states have additional requirements to become licensed. Some states require 1 year of work experience in public auditing while other require 2 years of general public accounting experience. States also require an ethics exam that is published by the AICPA. Check your state’s requirements before you start planning your exam process. 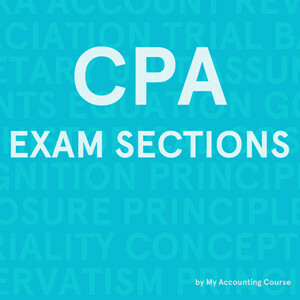 The CPA exam consists of four sections. Each section covers different topics and materials. All the sections have 3-4 testlets multiple-choice questions. AUD, FAR, and REG all have task-based simulations where business situations are given and you are expected to compute calculations and show your real-life understanding of the topics. The BEC section has a written communications section that requires four business essays written on various topics. The AUD section is the longest CPA exam section taking 4.5 hours. It includes topics about GAAS, public company auditing, attestation guidelines and rules, and internal controls. The BEC section mainly covers managerial accounting topics like breakeven analysis and budgeting processes along with general economic concepts. The BEC exam is 2.5 hours in length and is widely recognized as the most basic CPA exam. The FAR section is not the longest CPA exam section, but it does cover the most material. FAR covers all GAAP concepts. This section is 4 hours in length. The REG section of the exam covers business law as well as individual and business tax topics. The REG section is 3 hours in length. The CPA exam is one of the most difficult professional exams and the 50 percent national pass rates demonstrate this fact. If you choice to take the CPA exam, make sure to give yourself 1.5-2 months on average to study for each section. I studied for a month for each section and felt like I could have used more time. There are numerous CPA exam study courses designed to help you remember accounting concepts and reduce study time.